A day without moving is a lost day. On those few exceptional days, when I cannot move, I am suffering and usually also the ones around me. Because on those days I am moody, unbearable and simply terrible. It just like with an addiction. If the body does not get its daily ration, chemical processes begin to run, which make me unbearable as a person. And since currently I am forbidden to go running – which is bad enough – I am forced to do other sports. Running is simple. One simply puts on trousers, t-shirt and shoes and if it is already dark a head lamp and within half an hour I get my daily ration. Apart from gymnastics at home, all other sports are rather costly from a time and financial point of view and in autumn and winter, where the days are short, not even easy to include in the daily routine. The weekend is then the much awaiting rescue, where together with my son I catch up everything I missed out during the week. We bought inflatable canoes. This is a great thing, which also technically less given people like me manage to build up within 15 minutes. And thus we were out with our boats on the Greifensee on Saturday afternoon. It is different every time. It was very sunny but windy. Ship traffic had stopped at the end of October. The lake was wonderful empty but not completely quiet because the wind made little waves onto it. We were astonished to see how many people were up and around. It is usual for such sunny day that the lake shore was full but that we met a swimmer so far from the edge in the 12 degree cold water was surprising. There were the last two sailing boats, which probably had been pulled out in the evening for the winter. Also a young man in shorts on a stand-up paddling board passed us. And then there was the little kayak with the gentleman in his best years who appeared a bit plump. He had a good speed and also passed us. And then, out of a sudden he did a Greenland roll. He turned around his own axis, by 360 degrees, disappeared under water and within seconds he surfaced again. We were both very much impressed. Suddenly everyone was gone and we were completely alone on the water. My son and I. In the distance the snow covered mountains, the slowing sinking sun and an all comprising silence. I realised that it gets really cold when the sun goes down. I ordered to turn and go back. But my youngest one did not want to paddle any more. I had to think of something because he started to complain and suddenly found the idea of the canoe trip stupid and did not want to go on. I shortly thought and started to tell him a story of little boy who had found a bottle. The bottle was a Jeannie who fulfilled every wish, just that something went wrong every time. For example when he wanted gummi bears, she conjured that many gummi bears that he could not move any more in this room because of all the gummi bears, let alone leave the room. As my little one liked the story and wanted to listen to it, he had to be at the same height as I was in order to understand me. So he had to paddle without me telling him six times per minute that he should paddle. Only then we realised how far away from our starting point we were. It was still quite some way back but we managed just before the sun went down definitely. And when the sun was gone, it was freezing cold with 5 degrees, just as usual for November. 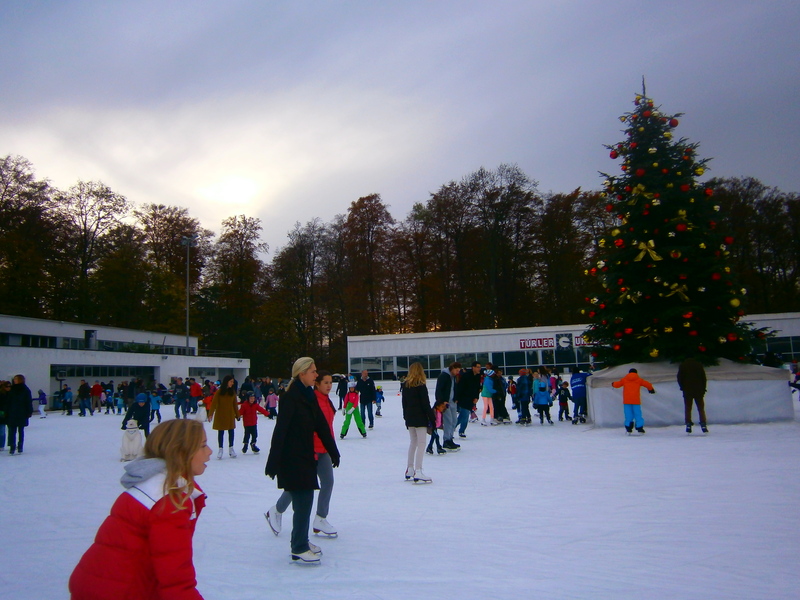 On Sunday we decided to go ice skating. The sun came out only a little bit but it seemed that half Zurich had decided to go ice skating at the Dolder. It was full, very full. An on top of it there was a Christmas tree in the middle of the ice skating field and that on 9 November!! We put on our ice skating shoes and threw ourselves in the masses. On the ice we soon saw the girls taking figure skating lessons. One recognises them by their clothes and ice skating shoes and usually they can be found in the middle of the ice. Also easy to recognise are the hockey players. With their abrupt and almost artistic manoeuvres on the ice, virtually being on their way with squeaky “tyres” and not to be overseen. An then there are the older age groups, which shone sometime 20, 30 or even more years ago on the ice as ice princess or hockey pro. They are very proud of what they still know and want to share it with everyone. This is great and entertaining if the ice is half empty but on days like these rather demanding. Whereby it is soon to be seen that people find their way in the chaos of movements, even without much regulation and in large masses. Even though the little ones fell, the ice princesses suddenly stop and the wild guys go at hell’s speed against the stream, there are hardly any collisions on days like these. We got red cheeks just on the day before on the water and we had changed silence and solitude for masses of people, canned music and laughter of the people. Bot was fun and we are prepared for the next week.